After all my treatment I was so very tired, and had no energy to start working on a new career path even though I needed a employment change in my life. While in treatment I was always looking for things to make my journey easier and could not really find anything to help me. That is when I decided to open a shop, My Left Breast (www.myleftbreast.ca), specializing in wigs and bra fittings especially for those who had had mastectomies and lumpectomies. Initially I struggled emotionally with making a living from cancer and then realized there are many ways I can help. I try my best to offer people information about reducing environmental exposures to substances which may increase their chances of a cancer diagnosis. I provide a line of personnel care products that are free of Parabens and Phthalates. I do my best to provide my customers with resources about prevention while helping them find what they need to create a sense of confidence and security during and post treatment. I am a firm believer that our environment is the reason our cancer rates are so high. I was a young healthy woman, who – like many others – had no known risks for breast cancer other than being a woman. I ate my veggies, had my children in my early twenties, breast fed both children, exercised, never smoked and never microwaved with plastic. I did drink water out of plastic bottles, I did use make-up every day of my life from 13 until my breast cancer diagnosis, and I did dye my hair (until my treatment). The only reason I can come up with for my cancer diagnosis was that I lived on a small farm, and my bedroom was very close to a large section of hydro lines and pesticide exposures. I no longer wear make-up or dye my hair. I use personal care products free of toxins and use plant based cleaners – no more chemicals for me and my family. We eat organic food when available, and keep all our food in glass or stainless steel containers. We avoid deep fried food, luncheon meats, and barbequed food. The biggest and most wonderful change in my life is that my stress is reduced stress and my enjoyment of family and friends is much greater. That is the gift cancer provided me, but at what expense? I meet women everyday with a similar story and wonder when cancer rates will ever start to go down. 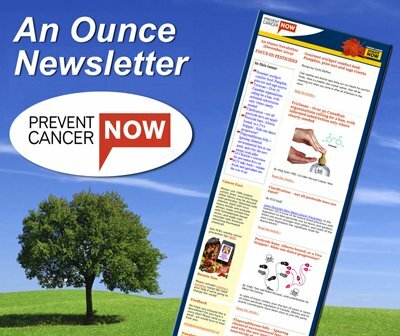 Thanks to Prevent Cancer Now for all the work you do and the information you publish. I appreciate your well researched information and the tips you provide offering information and strategies.